Central Florida’s Newest Destination. Come see why Exploration Tower is more than an attraction, it’s an experience. Exploration Tower is the perfect setting for your Wedding, Reception, Corporate Meetings, Private Parties and more. Let us help you plan the event of a lifetime. Be a Port Canaveral Pilot navigating your boat through Canaveral Harbor or explore the origins of Florida through our interactive simulator. Whether you’re here to have lunch or watch a launch, you’ll have a spectacular bird’s eye view of Port Canaveral and the surrounding area, from our two observation decks. Located along the East Coast of Florida in Port Canaveral, Exploration Tower is a stunning architectural landmark providing visitors both fun and education. With seven floors of exhibits and interactive play, Exploration Tower includes something for everyone. Visitors will have access to our indoor and outdoor observation decks, nearly 5,550 feet of exhibit space, an auditorium, a café, a gift shop and much more. We also offer unique space and amenities for corporate or special events. We are committed to providing an experience that you and your family will remember forever! 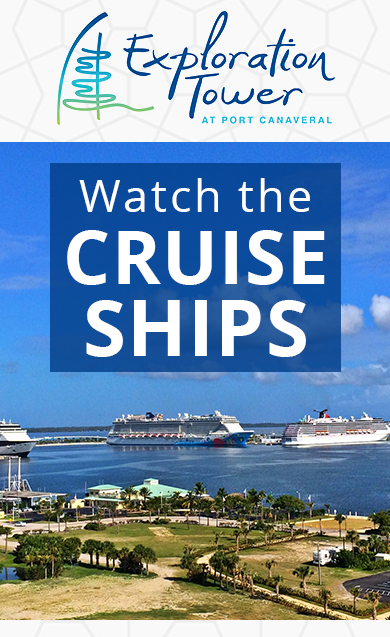 If you're visiting Port Canaveral, plan your day around us. As one of the top destinations in Florida, there’s a lot to do and see, and we want to be included in your trip to our beautiful port side. Enjoy one of Port Canaveral’s beaches and three parks, camping locations, multiple boating and fishing spots, or stroll through the regions restaurants, lounges and shopping. Get started planning your adventure to Exploration Tower today!